The Chief Customer Office aims to keep its members apprised on how brands and organizations are adjusting to customer empowerment, which is largely powered by digital social technologies. We do this by scouring the Web for the most insightful and practical thoughts and conversations about providing seamless, empathic business processes that improve customer experience. We are very excited that executives and boards are realizing how customer experience drives brand value because we’ve been in the CX trenches for decades. We have discovered that firms can make more money by adopting a more personal, human approach to people. Digital social makes this efficient and lucrative for the first time. CSRA launched the Chief Customer Office in 2015 after its very successful predecessor, the Chief Digital Office. They are the brainchildren of Christopher S. Rollyson, the chief instigator here and over at CSRA. CSRA believes that we add unique value to CCOs because we have ten years of experience using digital social technologies to develop trust, relationship, preference, and profit. We develop trust and profit at scale by activating the Trust Business Chain Reaction. We serve businesses, nonprofits and governments that want to increase trust with the people they care about most. We are very excited that organizations have begun to realize that they need give new focus to customer experience. 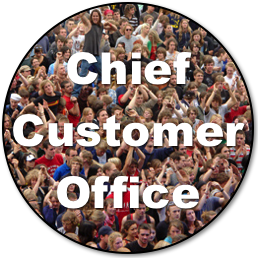 Chief customer officers and “customer success” both aim to substantially improve customer experience and profit. I have served organizations and executives for over 25 years as a consultant and line executive. I have specialized in guiding clients’ adoption of disruptive technology, and I launched CSRA in 2006 to pioneer in social business and social media. Contact has links to my various profiles, where you can learn more.